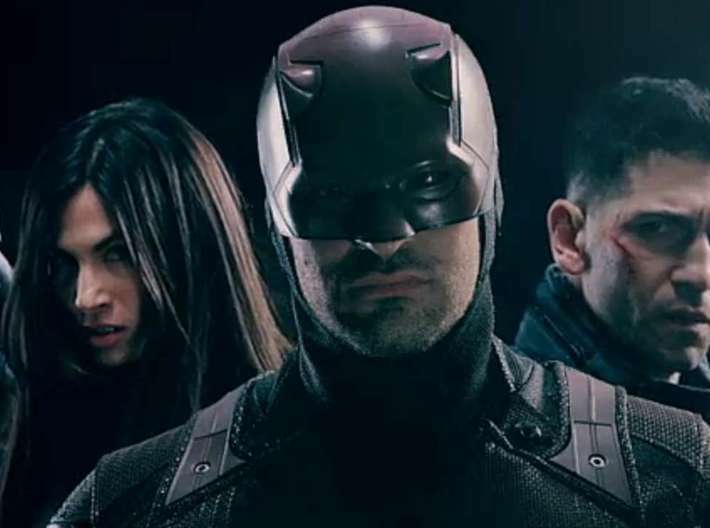 Netflix hit a gold mine with their Marvel shows, and Daredevil kicked off the success with a terrific first season. While the second season had it's issues *coughelektracough*, it also had it's highs with the inclusion of the Punisher. 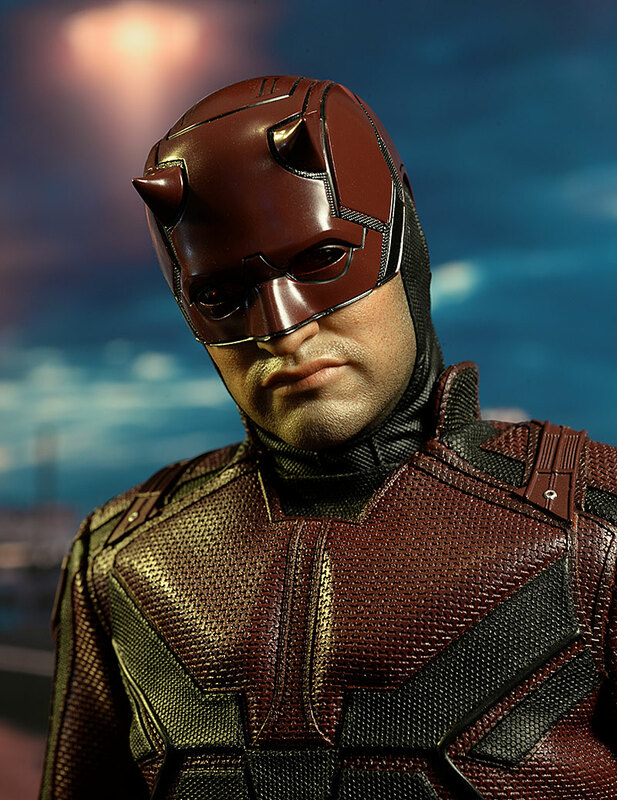 Daredevil remains one of the strongest characters in the current Netflix Marvel stable, although Jessica Jones is still my fav of the headliners. 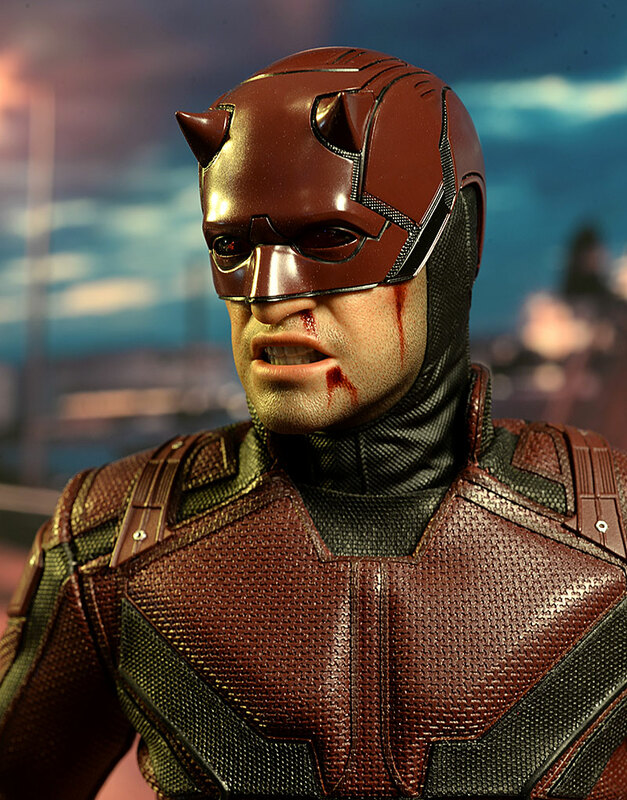 It only makes sense that Hot Toys, who have been cranking out unlimited numbers of Marvel Cinematic Universe figures, would dive into the television pool as well. 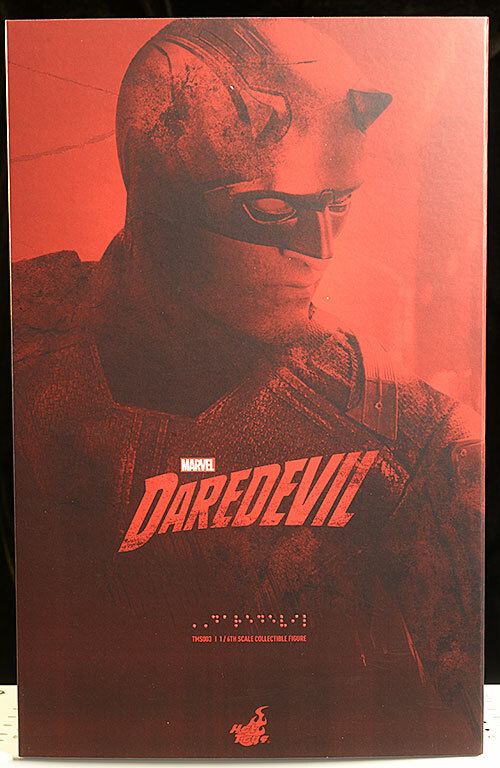 They're starting their Netflix line the same way Netflix did - with Daredevil. You can pick him up at most online retailers for around $230, give or take a few bucks. Another fairly basic design, with simple graphics on the cover. This is the usual slip cover style, with a window box inside the slip. Everything is collector friendly of course, and you can easily pop the figure and accessories out without damaging the packaging. We only get the cowl covered head here - no second portrait. That means you don't get quite the same level of scrutiny on the face...but c'mon, you know us collectors will still scrutinize. 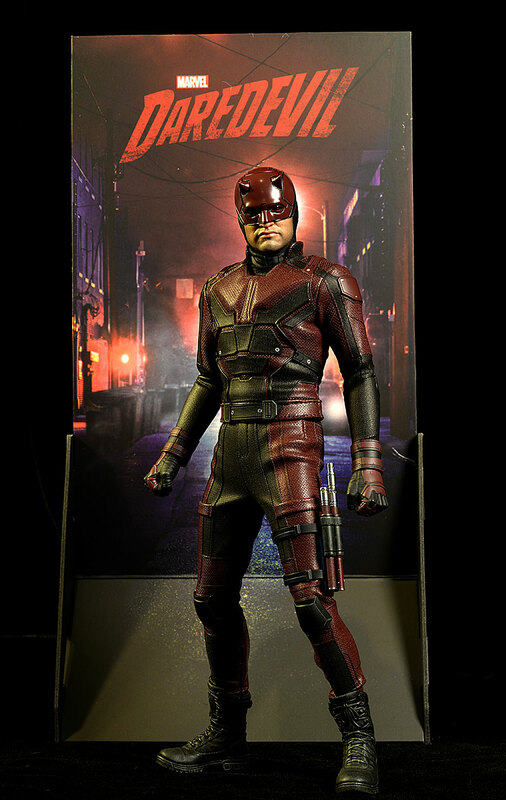 Here's Charlie in the second season cowl, up close. You can see they did a solid job with the nose, lips and jawline, although it does look like the chin juts out just a smidge too much. The stubble is almost non-existent, and that's another area where I think they could have upped their game with this release. The head also seems just a little too big to me as well, maybe 10% or so. There's something wonky about the overall proportions, but I can't quite put my finger on it. While we don't get two portraits, we do get two lower face plates. The second is a bit battle damaged, with some blood coming from a couple wounds, and has his open mouth set in a grimace. I like this look a bit better for most action poses, but the calmer look works well if you're going for something a bit more static on the shelf. The standout here are the teeth, something that Hot Toys has really gotten good at. These are extremely realistic, even in extreme macro photos. To swap faces, you pop the cowl off the top of the head, then remove and reattach the face plate. Pop the cowl back on, and voila, instant attitude adjustment. The fit is very good, and you can't see any seam line or gap. The work on the cowl is great, with some excellent texturing and style. 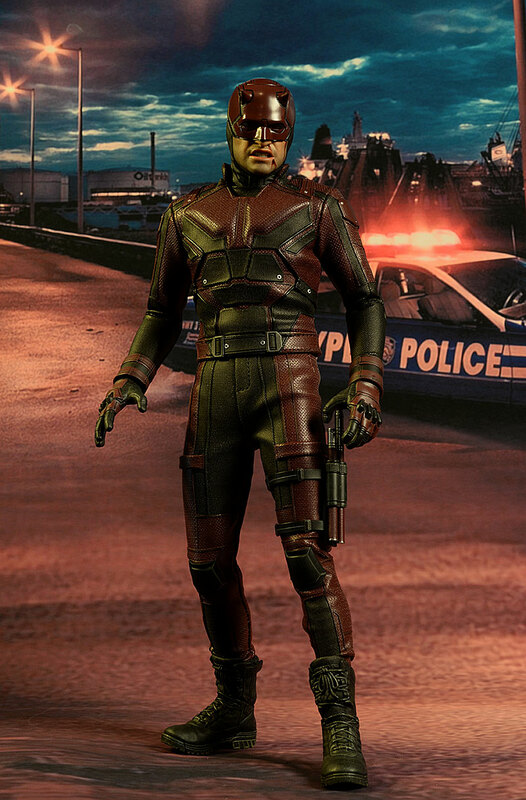 The sculpted areas of the suit also have a nice texture, and the sculpted two piece boots look great. The various hands are in scale, and work with multiple poses. One final nit - he's a tad short as well. 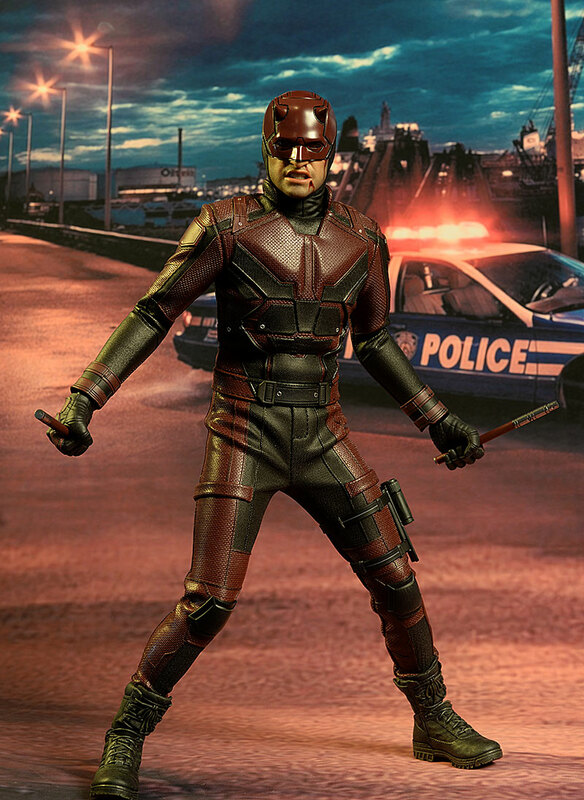 He comes in right about 11 3/4", which puts him a little smaller than most of the other Marvel heroes. Hot Toys production paint remains top notch, but this time it's a tad lacking in one specific area. Both lower faces have a consistent, realistic skin tone. The teeth on the open mouth look terrific, and the lips on both are about right. The blood work on the second lower face is also very good, with a slightly wet, almost translucent appearance that's much more realistic than the usual 'slap some red paint on' approach of other companies. But the beard stubble on both is pretty weak, with more texture than there is color. What was sculpted into the skin is largely lost thanks to the lack of a realistic beard paint job. The body is very articulated underneath the suit, but the suit is VERY restrictive and tight. The neck works great though, as do the elbows and wrists. The ball at the wrists is pretty well hidden by the suit and sculpted gloves. The shoulders are quite restricted - no high arm poses here - and the torso can only turn and bend slightly. The hips are also restricted by the suit, and medium depth stances are about all you'll get. The knees and ankles work well, and the two piece boot design allows for good foot mobility. The hands swap easily and stay in place. 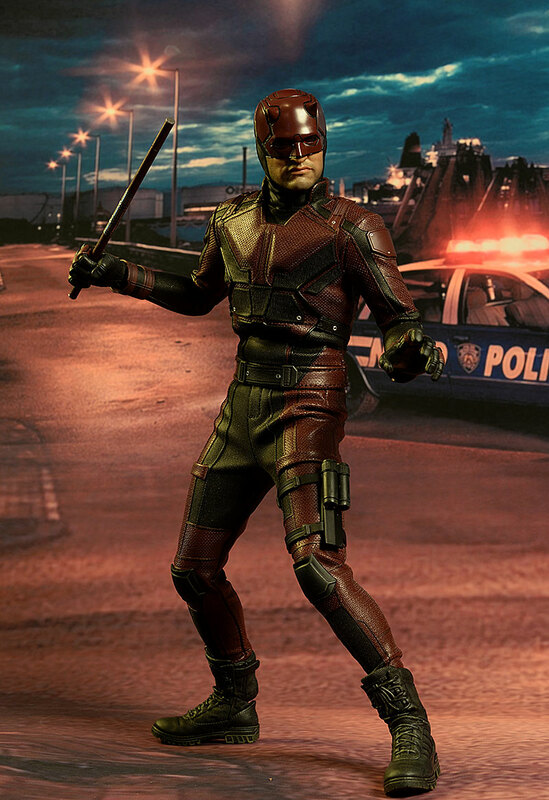 A little more torso and hip movement would have been terrific, but they are working with a tough costume design. I mentioned the weird looking internal proportions earlier, and it's worth nothing here that the forearms seem oddly long and the lower legs a tad thin as well. He's not outfitted to the max, but he has some critical extras. I already discussed the second lower face, both in terms of sculpt and paint. 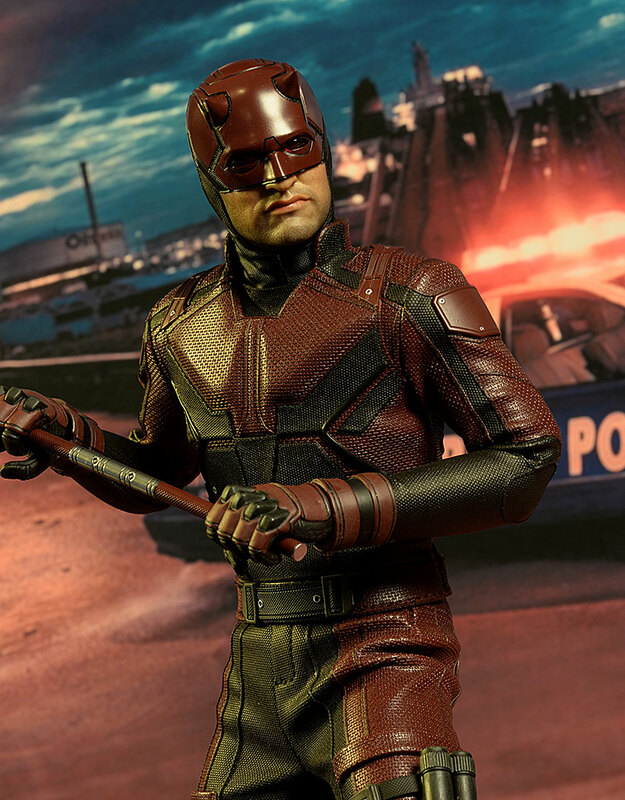 A complete, unmasked head would have been great, and considering how often he took his cowl off in the first season, not that out of place. He comes wearing a set of fists, and also has a set of tight grip hands and open posed hands. These swap easily, with no fear of damaging the wrists, but there's a couple extra pegs included just in case. 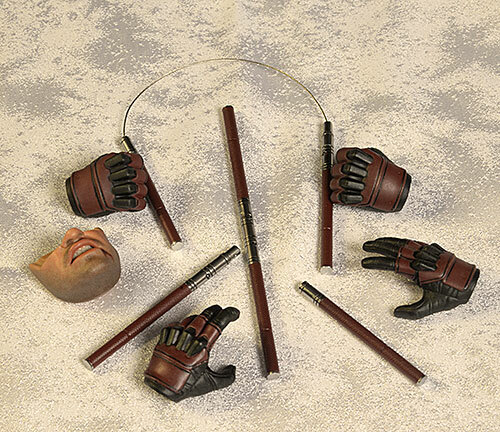 His baton, or 'billy club' as Hot Toys likes to call it, comes in three varieties. There's a full length connected version, a disconnected version (perfect for slipping inside the holder on his left thigh), and a set connected by a thin string, nunchuk style. He also has a crotch support display base, and there's a second diorama style piece that you can use in conjunction with it or by itself. Finally, they've included another of the cardboard backdrops. This one is attractive enough, but printed on only one side. I think they're really too small to be particularly useful, but your mileage may vary. I'm a bit disappointed in the look and fit of the outfit, particularly around the crotch and stomach. It's a fairly stiff leather-like material, with sculpted plastic pieces attached. I expected it to be fairly restrictive, so that's not a real surprise. But the crotch is baggy, hanging down too far right out of the box. In the photo with the cardboard backdrop, and in the photo with the diorama base, he's straight out of the box. In the others, I spent quite a bit of time trying to work the material up the legs to reduce the baggy, puffy look. I did succeed to some degree, but the material wrinkles big time around the hips in that pose, and it tends to work its way back down again as you move the legs. 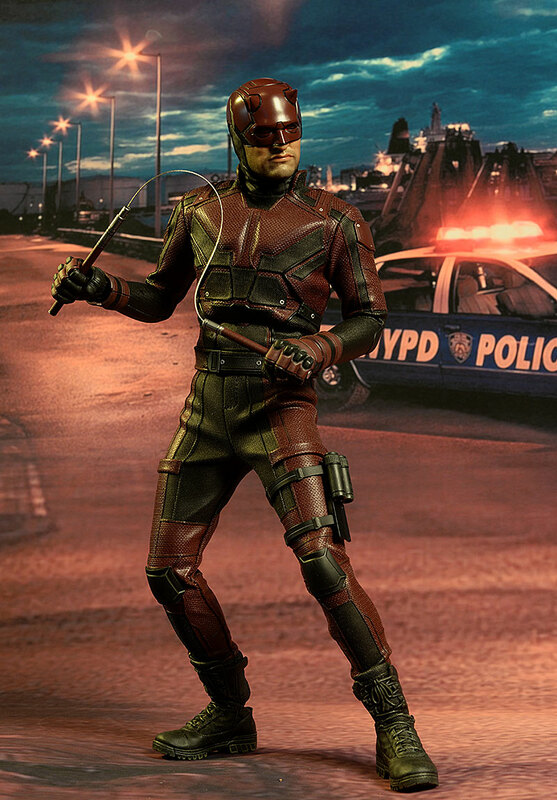 The highlight is the sculpted two piece boots, always a smart move with a character like this. If you use the crotch support stand, you can get some interesting jumping or leaping poses, but I am a bit worried about the costume material being left in a dynamic pose for any long period of time. 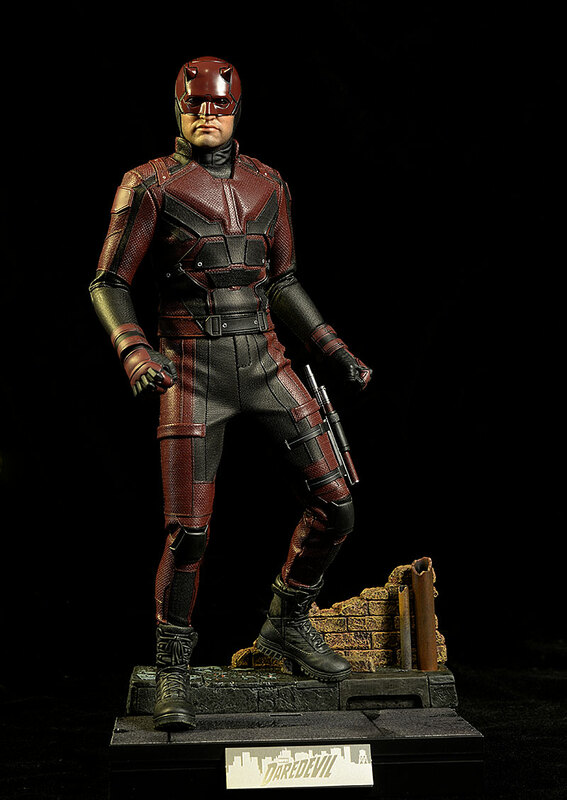 At $230, he's costing you as much as any other Hot Toys standard release right now, and he's lacking in a few areas. There aren't a ton of extras, there's no special features, and I was a bit let down by the costume and overall proportions. When you pop off the cowl to swap faces, don't be squeezing the sides too tightly. When it pops free, you could break the cowl with too much pressure inward. I have to say that I'm a bit underwhelmed by this guy. 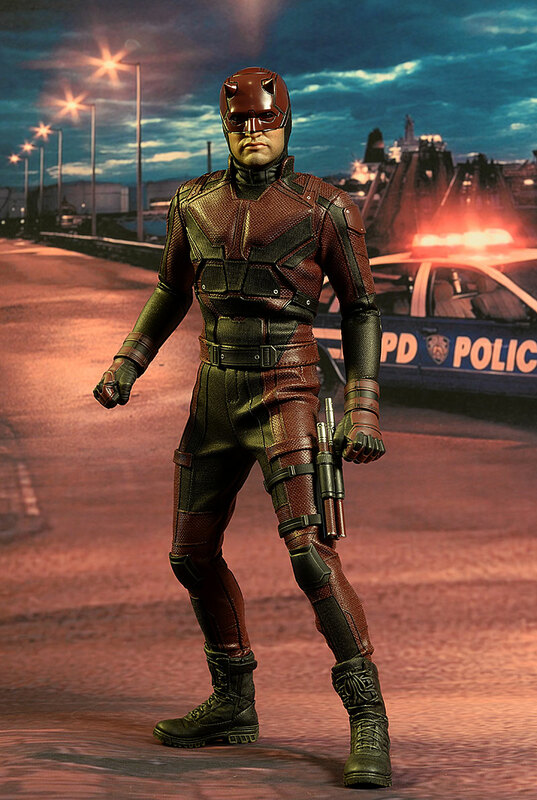 Perhaps it's because the prototype looked so amazing at SDCC, or perhaps I was just expecting something similar to the fantastic job they did with Deadpool last year. But the overall execution isn't quite as tight this time around, and while I'm glad I picked him up (he'll look great with the upcoming Punisher), I'm just not blown away like I expected to be. The head sculpt and paint work are still well above average, but the head is a little large for the body, and the costume (especially the droopy crotch) is annoying. Again, Deadpool wears something similar, and they didn't have this sort of problem with him. Me thinks someone made a slight miscalculation on the tailoring in production. The upcoming Punisher looks outstanding - let's keep our fingers crossed on that one. - has him for $225. - comes in at $230. - Sideshow has him at $230 as well. 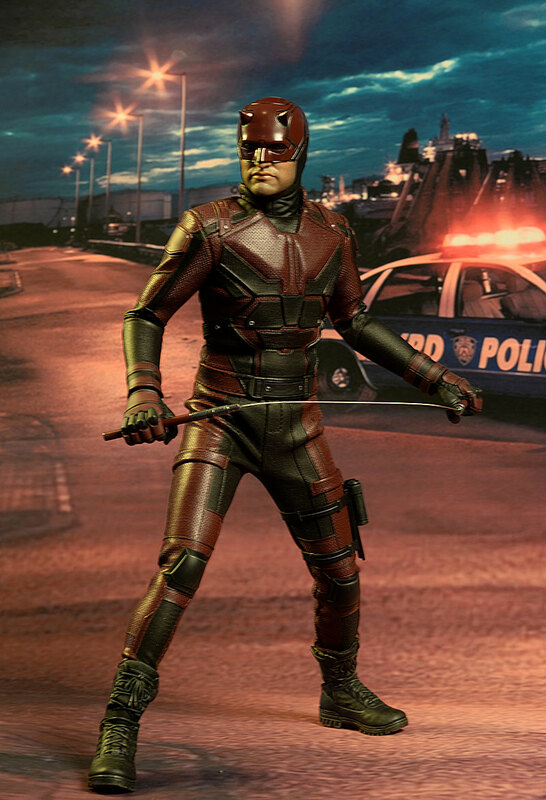 We'll be getting a Punisher for sure, but until then, this is the only one of the Netflix Marvel figures out. There's plenty of other Marvel releases however, and the most recent review covered the move Dr. Strange and the TV Ghost Rider.